CathGuard™ is a unique, water-resistant, soft fabric, protective pocket. It provides maximum patient comfort while protecting and storing the exterior lumen of the patient's central line catheter between dialysis treatments. A patient's catheter can be quickly and easily placed into the pocket. Each CathGuard™ pocket has its own self-adhesive strips for attaching the pocket to the patient's skin. CathGuard™ adhesive strips are designed to attach the pocket securely to the patient, yet make the pocket easy to remove without causing discomfort for the patient. Use of CathGuard™ helps to immobilize the patient's catheter and may aid in reducing trauma to the catheter surgical insertion site. 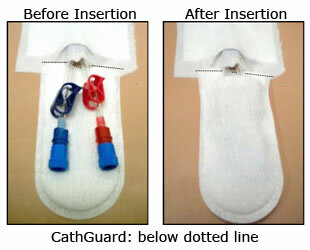 In addition, CathGuard™ keeps the catheter clean, may help prevent infections, safeguards the integrity of the catheter caps, and presents a flatter, less-visible profile. • Protects patient and catheter. Soft, water resistant fabric pocket. • Eliminates mess and fuss of dealing with tape and gauze. • Adhesive strips secure pocket to patient without discomfort on removal. • Saves staff time by simplifying patient off dialysis procedure. • Easy-to-use: insert catheter; remove backing; attach to patient's skin. • Cost-effective, unique product. Well-liked by patients and staff. 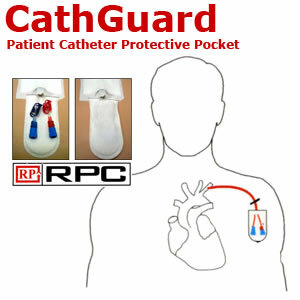 The RPC CathGuardTM Patient Catheter Protective Pocket is intended as a protective device for external central lumen catheters, and to provide comfort for the dialysis patient between dialysis treatments. Exterior catheter immobilization provided by the CathGuard may reduce trauma due to pulling at the central line site. CathGuard is a disposable device and regular replacement at each dialysis treatment is recommended. CathGuard is not intended for use as a central line site dressing and provides no protection to the site itself. CathGuard is non-sterile. Follow the instructions provided by your medical provider for central line dressing care. CathGuard is water-resistant but not water-proof. 1. Carefully place the CathGuard pocket over the exterior lumen of the central line catheter. 2. Slide the catheter lumen and caps into the CathGuard. Avoid pulling on the catheter site. 3. With the catheter in place inside the CathGuard, remove the two adhesive strip covers on the back of the CathGuard and secure it to the patient's skin. Use of a skin prep will improve CathGuard adherence and may increase patient comfort by reducing skin irritation.